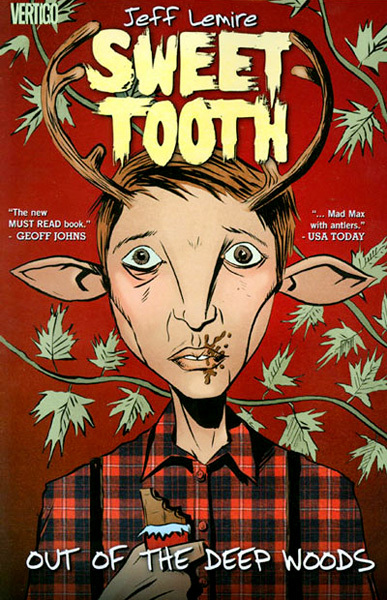 Canadian comics artist Jeff Lemire’s Sweet Tooth is a different kind of apocalyptic fiction, imagining an adolescent human-animal hybrid that comes into existence after an event known only as “the Affliction.” Protagonist Gus, nicknamed Sweet Tooth by a man named Jepperd, appears normal by all accounts – except for the skinny antlers protruding from the sides of his head and his elongated ears. Lemire’s style made familiar through his book Essex Country is here, too, but it seems changed when it appears in a more fantastical setting. Sweet Tooth starts deep in the woods, where Gus has been living with his father in a cabin removed from civilization. Gus’s father is showing signs of his sickness worsening, a result of “the Affliction” that has caused billions of people to die previously. Gus has been sheltered and protected in the woods, and when his father dies, it is only after Gus promises to never leave the woods. However, Gus does leave, after a man named Jepperd saves him from two hunters who find him and try to catch him. They talk about taking him to someone who will purchase him for a price, as Lemire gives away small details of the dystopic world he has created and the rules that it runs by. Jepperd becomes Gus’s unlikely protector, taking him away from the cabin and promising to take him to “The Preserve,” a place where hybrid children can be safe. Gus’s “sweet tooth” earns him his nickname, as he eats as much chocolate as Jepperd will give him, a stash that he’s saved up for years. The purpose of Jepperd seems to be to introduce both Gus and the reader to the dystopian world, through a series of episodes that take place along the side of abandoned roads, in the city, in an old apartment building, and in run-down farmhouses. Gus learns what the world looks like, and the reader learns what the world looks like now, while Jepperd’s defense and protection of Gus seems at once both noble and suspicious. As well, Lemire experiments with his art in short dream sequences, as Gus dreams at night in an almost distorted Disney-style, which Jepperd attributes to him eating too much chocolate before bedtime. The edges of this dystopia are sharp and its inhabitants are hardened; this is the first time Gus has left home, and although he doesn’t have anything to compare what he sees too, he senses the terrifying difference in this place. The violence is dispelled with by Jepperd when it needs to be, as Gus stands back and watches, trying to understand his new protector and guardian. Gus holds the dystopic, imaginative details of Lemire’s plot together, his naivety, gentle nature, and kindness both out of place and necessary in this world. Sweet Tooth has been collected into four volumes so far, and I’m looking forward to finding out what happens to Gus next, especially after seeing the place at the end of Out of the Deep Woods that Lemire left him in. 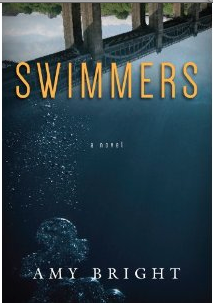 Swimmers is the story of 17-year-old Hunter Ryan, and his trip across the Rocky Mountains in a Greyhound bus as it takes him back to the one place he's been running from. 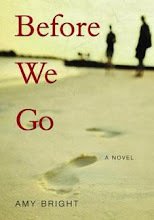 "Before We Go is the moving story of three kids propelled toward a surprising future by family secrets that have spanned generations." You can now find all of the book reviews on this blog in one place! Alphabetically!